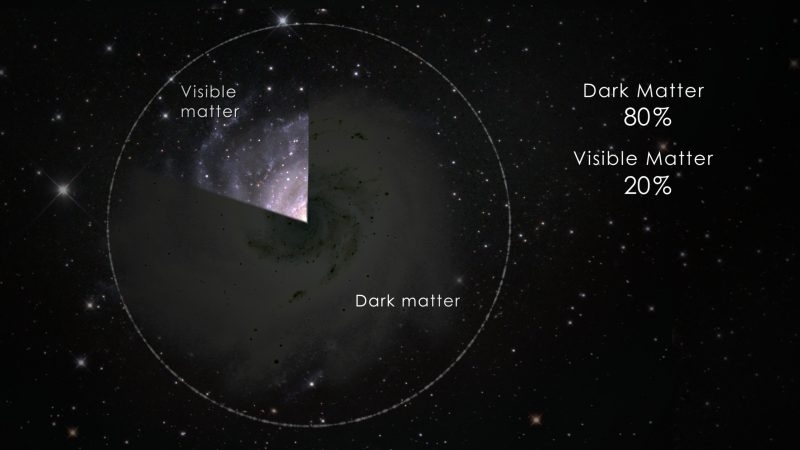 This NASA image illustrates the fact that most astrophysicists think there is about four times as much dark matter as visible matter in the universe. A couple of months ago, I wrote an article about a galaxy that has no “need” for dark matter. This is interesting, because most galaxies “need” dark matter to explain the motion of their stars. Based on the mass that is actually observed in most galaxies, the stars should not be moving the way that they do. Thus, scientists think there must be a lot of mass in those galaxies that cannot be seen (dark matter). To make their current theories work, scientists estimate that about 80-85% of the mass in the universe comes from dark matter. Since dark matter is thought to be so prevalent in the universe, scientists have tried to detect it directly, without any luck. How do you detect something you can’t see? First, you have to have some idea of what you are looking for. Then, you design an experiment to see if what you think you might be looking for really exists. The most “promising” candidate for dark matter is a class of hypothetical particles called “weakly interacting massive particles” (WIMPs). These are particles that don’t interact with matter using the electromagnetic force. Since the electromagnetic force works via the exchange of photons, if a particle doesn’t use the electromagnetic force, it produces no light. Instead, WIMPs are thought to use only the gravitational force and the weak force, which works only at the subatomic level and is responsible for most of the natural radioactivity on planet earth. Since all the matter we know of uses the electromagnetic force, WIMPs are obviously strange particles. However, they are allowed by the mathematics of the standard model of physics, which is why they are considered the most “promising” of the candidates for dark matter. How do scientist try to detect WIMPs? The most sensitive WIMP detector is called XENON1T, which is filled with liquid and gaseous xenon. The design of the detector allows scientists to identify electromagnetic interactions that occur between particles hitting the detector and the liquid xenon inside. They discard those interactions, and what’s left should be any interactions that use only the weak force. Those, of course, would be caused by the WIMPs. The team of scientists using XENON1T reported their latest results at a seminar on May 28th, and so far, they have not seen a signal that is consistent with what is expected for WIMPs. I think their results argue strongly that WIMPs don’t exist, but that’s not the only explanation. The results could also mean that physicists don’t understand WIMPs as well as they thought, and these particles actually interact more weakly with matter than what the theories tell us. If WIMPs don’t exist, does that mean dark matter doesn’t exist? Of course not. Remember, to detect something, you have to have some idea of what you are detecting. There are other candidates for what dark matter might be. For a while, scientists thought that “massive astrophysics compact halo objects” (MACHOs) like neutron stars might be the answer. That would mean dark matter is similar to the matter we already know, but it’s just too dim to see with our telescopes. The problem with MACHOs is that according to the Big Bang Model, the universe couldn’t make enough of them to account for the amount of dark matter that is supposed to be in the universe. Of course, if the Big Bang Model is wrong, perhaps dark matter is made of MACHOs. Another candidate for dark matter is the axion. This theoretical particle was proposed to explain very odd experimental results involving the strong nuclear force. However, if they have the right mass, they could also compose dark matter. Experiments trying to detect axions have been developed, and one has recently demonstrated that it now has the proper sensitivity, if the axions have the properties they must have for dark matter. The Kaluza-Klein particle is another candidate for dark matter, and it’s probably the most exotic. It’s a particle that exists mostly in another dimension that we cannot see. While this sounds like science fiction, the theory that predicts it is at least mathematically sound. That doesn’t mean it’s accurate, but it does mean it’s more than wishful thinking. Even though the particles are mostly in this other dimension, large-energy collisions should force them to decay into particles we can measure in our four dimensions (the three dimensions of space, along with the dimension of time). That’s one of the things that particle accelerators like the Large Hadron Collider are looking for. Finally, some models suggest that the force of gravity involves the exchange of particles called “gravitons.” Some versions of those models suggest that the graviton has a partner particle, the gravitino. If the gravitino is light enough, it could also be a candidate for dark matter. Of course, gravitons haven’t been detected, so for this to solve the dark matter problem, we have to believe in a possible partner particle of a particle that hasn’t yet been detected. Of course, there is one more possibility: there is no dark matter at all. Instead, it’s possible that gravity doesn’t work the way we think it does over galactic distances. Remember, most of what we know about gravity comes from experiments here on earth and in our solar system. That’s a very small scale compared to a galaxy! There are those who say that with some modifications, gravity alone can account for the motion of stars in galaxies. So based on the science we know right now, either 80-85% of the mass in the universe is made of this mysterious stuff called dark matter (which we so far have not detected), or gravity doesn’t work the way we think it does on galactic scales. That’s why I love science! It leads to amazing conundrums that might take decades or centuries to figure out! Whatever the solution it is clear that a number of competing theories will have to be discarded. The history of science is littered with discarded theories, many that for a time were the consensus position. This is why doubting any particular scientific theory does not make a person anti-science. You mentioned that gravity may not behave or function/work the way we think so on a galactic scale. Could that be the same for mathematics? Can equations really explain how the universe works and its origins? Just out of curiosity, do you have an criticism against the big bang? I read that there may not be enough red shifts for the amount time that most cosmologist give the age of the universe. It’s always possible that math breaks down on galactic scales, but I am philosophically opposed to that solution. I would need some really strong evidence to believe that! I do have a lot of problems with the Big Bang. Probably the most important one is that it requires an assumption that we know is not true: the cosmological principle. You can read about other problems here. I always liked dark photons and sterile neutrinos. Though last I heard dark photons have been ruled out. Yes, dark photons have been ruled out. I guess I am not familiar with sterile neutrinos. Google University tells me they are neutrinos that interact only via gravity. I will have to look into them more! Forgive my ignorance here. I have a simple question regarding dark matter: What makes us think that we should “see” it? That is: Why should we expect to receive some sort of EM radiation from all matter? 2) the potential challenge to an assumption of local-to-general continuity. That is, the theorization of something we have no experience with naturally begs the question as to why we would assume anything out there is anything like what we have here such that we use local experience to analyze data from distant objects. Good questions, Jim. First, we wouldn’t expect to see EM radiation coming from dark matter. It is assumed that dark matter doesn’t interact electromagnetically, which is why we don’t detect it with telescopes that are sensitive to a wide range of EM frequencies. What we assume is that it must interact via the gravitational force. After all, it is “needed” to understand the motion of the stars in a galaxy, and that’s governed by the gravitational force. It is also possible that it interacts via the weak force, since that kind of interaction would not directly result in any EM radiation, either. Thus, we can try to “see” dark matter by detecting its gravitational or weak interactions. 1) One reason WIMPs, MACHOs, gravitinos, axions, and Kaluza-Klein particles are considered is because all of them are allowed to exist by the standard model. Thus, no new method of producing particles is necessary. According to Jake, the standard model has a spot for another candidate that I had never heard of: sterile neutrinos. So while I am sure some astrophysicists are willing to consider other particles, the major candidates are ones whose generation is at least possible. 2) This is a very important consideration. We have no empirical reason to believe in local-to-general continuity. However, it has worked in at least some cases. For example, Newton used what he learned about gravity on earth and applied it to our entire solar system, and it worked wonderfully. Also, the basic principles of life were first observed in the macroscopic world, but they apply all the way down to the microscopic world. I would think that’s another example of local-to-general continuity. Also, what choice do we have? We might as well at least hope that it works. If we eventually rule out dark matter, then we probably have to come to the conclusion that it doesn’t work in all cases. For right now, however, it’s the best we can do. Personally I’ve detected several wimps in the scientific field. The whole search for dark matter reminds me of the search for the ether in late 19th/early 20th century. I’m not a scientist but it seems to me based on the history of science that if your theory requires things you are not able to detect even with advancing technology it is the theory that is wrong, not the detection. Atoms were eventually detected even though they were debated hotly for years. Just my thoughts. Interesting idea Eric, but sometimes the method of detection is wrong. Absolutely, just like I mentioned with atoms. But the search for dark matter just reminds very much of the search for ether and I have not seen any scientists even mention alternate theories that don’t require dark matter. It may be that are methods of detection are wrong but nobody seems to be even considering the other possibility. I would have to disagree with you on that, Eric. There are people considering other possibilities. For example, the people who are promoting MOND are trying to get rid of dark matter. André Maeder is suggesting scale invariance as an alternative to dark matter. Erik Verlinde has proposed emergent gravity to get rid of dark matter. Now, I agree with you that most people only hear about dark matter, but there are scientists looking for alternatives. Great! I haven’t seen those theories yet. You are quite right that in the popular science press its just dark matter. I am quite glad that scientists are looking at alternative theories.